Methods Machine Tools, Inc., North America’s foremost supplier of leading-edge precision machine tools and automation, has recently partnered with Ocean Technologies Ltd. Inc. to offer high-quality, cost-effective EDM Drills throughout the U.S. and Canada including Ontario, Manitoba, Saskatchewan, Alberta and British Columbia. Specializing in Small Hole EDM Drilling, Ocean Technologies excels at applications ranging from simple wire start holes to advanced full 5-axis EDM drilling applications used throughout the aerospace and energy industries. Known for their high speed and low wear burning technology, Ocean has earned a reputation for high quality, competitively priced EDM Drilling solutions. The full line of Ocean models range from easy-to-use manual machines to fully programmable 5-axis machines, capable of drilling complex parts. Ocean’s EDM Drills have patented technologies for break-thru detection, and a proprietary HP1+ Power Supply for significantly reduced wear and shorter burn times while reducing energy consumption. The capabilities of Ocean machines include drilling fine holes from 0.004″ to 0.25″, even in spherical and curved work pieces, on materials such as hard alloy steels or powdered metals. Also, E-Learning software allows new operators to easily run the machines or seasoned operators to review processes on the fly. Included in the range of Ocean EDM Drills is the compact, entry-level River 300, featuring high-efficiency linear guideways, a 100L Filter and a DI (die electric) System that comes standard. The X-axis travel measures 11.8″ (300 mm), Y-axis at 7.9″ (200 mm), Z-axis at 11.8″ (300 mm) and W-axis at 13.8″ (350 mm). Table dimensions are 13.8″ x 9.9″ (350 x 250 mm). Mid-size Ocean EDM Drills include the River 600 6-axis computer controlled CNC with A/B axis configuration available. The X-axis travel measures 23.6″ (600 mm), Y-axis at 15.8″ (400 mm), Z-axis at 15.8″ (400 mm) and W-axis at 17.7″ (450 mm). Table dimensions are 23.6″ x 15.8″ (600 x 400 mm) and a 180L Filter System and DI System comes standard. For demanding, complex applications, Ocean solutions include the River 1000, featuring 5-Axis tool center point (TCP) control drilling capabilities suitable for irregular shaped work pieces or special alloy steel parts. Its flexible working range is ideal for all kinds of aero-engine blades and aero-engine diffusers. High table capacity allows for a maximum work piece weight of 6,614 lbs (3,000 kg) with a Tilt Table up to 120°. The X-axis travel measures 39.4″ (1,000 mm), Y-axis at 47.2″ (1,200 mm), Z-axis at 39.4″ (1,000 mm) and W-axis at 27.6″ (700 mm). Table dimensions are 47.2″ x 49.2″ (1,200 x 1,250 mm). About Ocean Technologies Ltd., Inc. Ocean Technologies is a world leader in manual and CNC EDM Drills and has been manufacturing EDM drilling equipment since 2000. 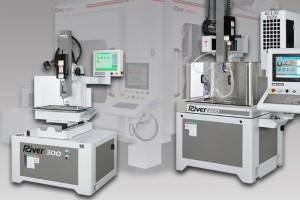 The company is globally recognized for its high quality and competitively priced EDM Drills. Ocean has 20 technology patents, and in September 2018 won an award from the Taiwan government for the best new innovation ‒ the HP1+ power supply. About Methods Machine Tools, Inc.
Methods Machine Tools, Inc., in operation for 60 years, is a leading supplier of precision machine tools, automation and accessories, providing extensive applications engineering support, installation, parts, service and training through a network of state-of-the-art technology centers and dealers throughout North America. For more information about the new Ocean partnership, please contact Mr. Steve Raucci, Methods’ EDM Product Manager at 65 Union Avenue, Sudbury, MA 01776, TEL: (978) 443-5388, FAX: (978) 440-9405 or visit their website at www.methodsmachine.com.